So, Chris does not often make special sewing requests but he wanted this and I accommodated. He made beer today and it has to sit for a couple weeks in the dark. 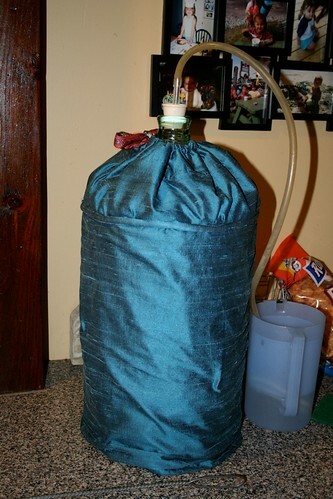 He prefers a 6 gallon glass carboy...you'd think the goofballs that make them would make dark colored ones, but no. And, he fully expects this thing to sit on the kitchen counter for all two of those weeks. I just so happened to have this silk curtain that I bought 3 yrs ago for $3 on clearance at Lowe's. I planned the Baby Boy's entire room around the color and then didnt use this curtain because I only had 1 and he has a 6 ft wide window. 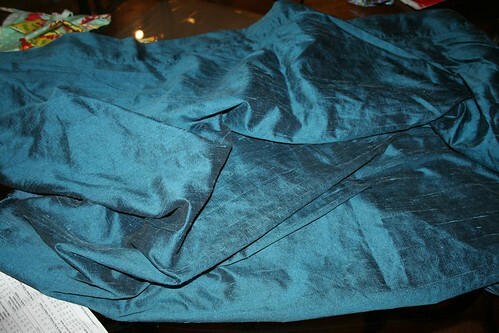 It is lined with a cotton fabric--therefore very dark. So, with this curtain and some braided stuff you make piping with...oh, and a cute ribbon left over from costume making, we now have this little beauty sitting on our counter. Really, probably not much cuter, but it is appropriately dark under there and at least I made an effort. Beer that is trying to do its thing is sorta gross looking--lots of bubbly, weird, yeasty foam. Now I dont have to see it until it is ready for drinking. So, TADA!! Beautious beer cozy. You know you want one!